If you learn about seed germination, you can grow many more plants in your garden! Do you want to grow those beautiful, frost-sensitive flowers or delicious vegetables, but you just don't have enough warm summer days to do it? Well, once you understand the basics of seed germination, you can grow whatever you want. Most seeds go through a dormant period and germinate when conditions are right -- usually in the spring. To grow to maturity, the plant then needs a certain number of days when conditions are favorable. These are called growing days. If the plant doesn't get enough growing days, it will die before flowering or setting fruit. The main limit on growing days is frost. A plant that is sensitive to frost can't be placed in the garden until after the last frost in the spring, and it will die with the first frost of the fall. Often, there are not enough frost-free days available to grow the plant. Gardeners get around this problem with seed germination procedures. When you start seeds indoors, you make the growing season longer. Start with the set-out date for the specific plant. Often, this is the last frost date in your locality. Plants that can tolerate mild frosts can be planted in the garden a little earlier, especially if you provide protection on cold nights. Decide how mature you want your plants to be when you put them in the soil. Flowers in flats at garden centers are often completely mature and flowering freely when you buy them. Slightly younger plants adjust more quickly to their new location and put down roots better. Check how many days the seedling will need to grow from germination to the right size to set out. This information is usually on the seed packet or in the seed catalog. Some seed germination is quicker than others. Check the average number of days your seeds will need to germinate. Add together the growing days and the germination days your seed will need. Find your set-out date, and count backwards on the calendar the total number of days you will need to grow the seedlings. That's your sowing date, the day you will start seed germination. For example: Suppose the last frost in your area usually comes around May 30th. That's your set-out date. You want almost mature plants to put in your garden, and you know this species takes about 60 days to mature. That means you want new seedlings to sprout around April 1st. If these seeds take about 10 days to germinate, you should plant them around March 20th. You will need a sterile growing medium. If you buy soil, be sure the label says it has been sterilized. Some gardeners prefer to use a soilless medium, such as a mix of peat, perlite, and vermiculite, for seed germination. The biggest problem in starting seeds indoors is damping off of seedlings. Using a sterilized medium minimizes the fungus spores that cause the problem. Providing good drainage and air circulation for the seedlings also reduces damping off. Seeds can be planted in flats, peat pots, or any of the commercially-available containers you see at the garden center. If these containers have been used the previous year, they should be sterilized before use.Seeds can also be planted in dixie cups, egg cartons, foil baking tins, or many other convenient objects. Just be sure you have punched plenty of holes to allow for drainage. 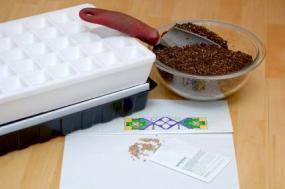 Many seed germination kits come with a clear plastic top. If you are using plain flats or other ordinary objects, you will need to make an airtight cover. Plastic wrap or a large plastic bag will do the job. Most gardeners buy fresh seed every year from a commercial company. Many popular flower and vegetable seeds are hybrids, and only grow well if purchased from a seed company. Heirloom seeds are usually seed from old-fashioned varieties of plants. These plants will grow reliably from seed collected the previous year in your garden. In either case, fresh seed will germinate more easily than seed that has been stored for several years. Most seeds germinate best when the soil temperature is around 70 degrees Fahrenheit. Some require warmer or cooler temperatures. Decide in advance where you will place the trays to provide the correct temperature. Some garden centers sell special warming devices for this. Wet the growing medium. It's easiest to do this while it is still in its bag; just cut off the top and stir the medium while adding water. You don't want it to be soaked and dripping, just evenly moist all the way through. Fill the container with the moist growing medium. It's usually best to add soil right up to the rim. Plant the seeds. Different seeds require different planting methods. For some, you will need to poke a hole in the medium, insert a single seed, and pat the hole shut. For others, you will sprinkle the seed across the surface of the growing medium. Check the directions on the seed packet. Cover the seed if necessary. Some seeds need light to germinate, so you should leave them on the surface of the soil. Others require darkness and must be covered. They may germinate best with a deep cover or a very light cover. Many gardeners use lightweight vermiculite to cover seeds. Water from the bottom by placing your flat or container in a larger container filled with tepid water. Cover the container, or put it inside a plastic bag and tie the bag shut. Place the container in the spot you have chosen. Check the seeds daily. 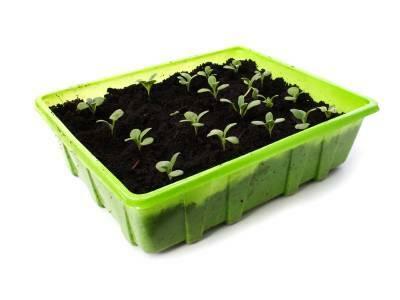 When the first two or three seedlings pop out of the soil, remove the plastic cover. Keep the container in the same spot for another day or two, until most of the seeds have germinated. Don't let the soil dry out. When most of the seed germination is complete, move the seedlings to a sunny windowsill and watch them grow!